Stannard Rock – Ice Fishing? 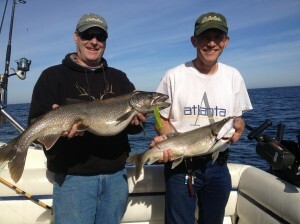 Stannard Rock is a great summer fishing destination, but who would want to go ice fishing there? Here in the frozen tundra of the U.P. and the Keweenaw in particular, ice and snow are among our two most abundant natural resources. The calendar point of reference is nine months of winter and three months of poor skiing, snowmobiling and ice fishing. North of the 46th, it comes with the territory. 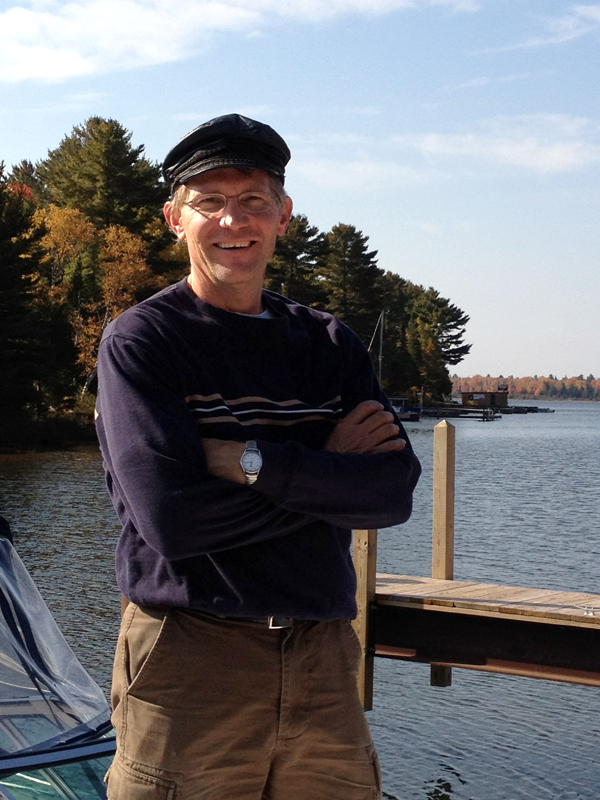 Yoopers aren’t the only ones who’ve sought adventure on ice and snow. It stems from participating in hard water winter sports and making the best of the long winters in the northern tier of the country. Kenneth LeBel set a long jump record on ice skates when he leaped over 17 barrels, a distance of 28 ft 8” at Liberty, NY in 1965. On her first trip in 1909, the world’s largest converted icebreaker, the S.S. Manhattan, 1007 ft long and 150,000 tons, made the first round trip voyage through the Northwest Passage of the Arctic Ocean, northern Canada to Alaska and back. 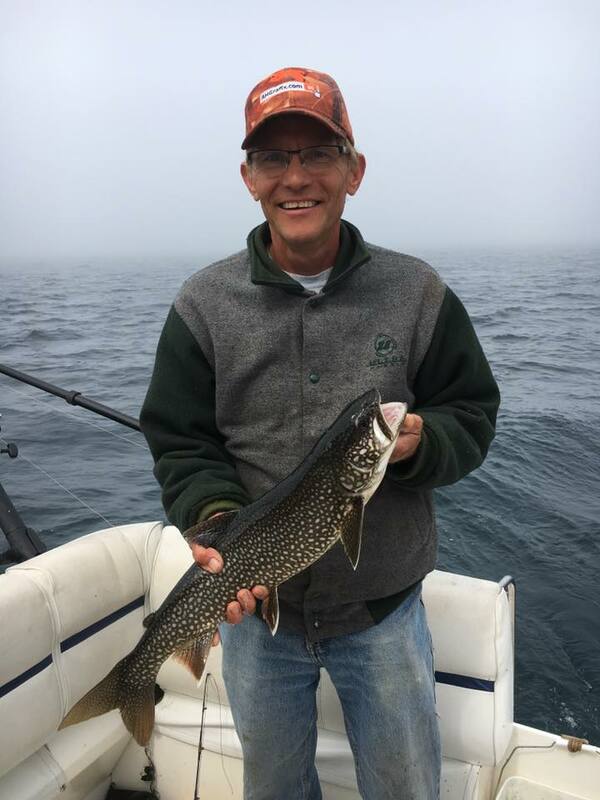 Growing up with the woods and water of the U.P., I’ve had an adventurous, restless spirit since high school; feeling the urge to travel and see what was around the next bend, beyond the horizon, and to fish places I’ve never fished before. It led me to spend summers between college years working on Isle Royale, and fishing remote, way offshore blue water destinations like Stannard Rock and Superior Shoals. Now that undiminished spirit of adventure wants to ice fish Stannard Rock. Preliminary planning involves snowmobiling out from Big Bay, drilling down, catching a few lunker lakers, shooting them with the lighthouse in the background and getting back to shore safe and sound. Sound like a tall order? Stannard Rock, 47.1683 N, 87.2120 W, is further from shore than any lighthouse in the United States. 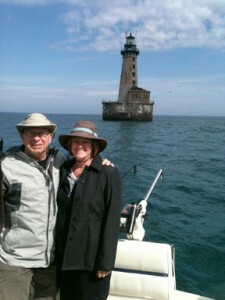 By all accounts, it is the most isolated lighthouse on the Great Lakes, if not the world. About 25 miles southeast of Manitou Island off the tippa the Keweenaw and 45 miles due northa Marquette, it marks one of the most treacherous reefs in Lake Superior and is a fishing destination for trophy lake trout. 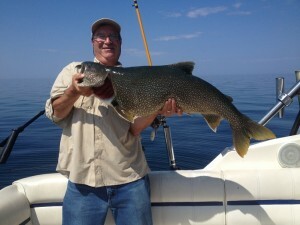 During the summer months, charter captains from Marquette, Copper Harbor, Lac la Belle and Baraga-L’Anse take clients on day trips to fish these waters. As you approach by boat, the lighthouse first appears as a dot on the horizon. As you get closer, it slowly grows until the tall, fortress-like, 100-foot granite tower comes into view. Back in the day, four men stationed there were happy for the company and would pop out of windows and wave, welcoming boats and fishermen. Captain Charles C. Stannard of the American Fur Company first charted the reef in 1835, reporting the treacherous shipping hazard and lobbying the government to build a lighthouse. Construction began in 1878 when granite and limestone blocks were quarried at Marblehead, OH and Kelly’s Island in Lake Erie and taken to Skanee where they were aligned and set up from bottom to top, numbered, and disassembled. Next they built a water-tight coffer dam which was floated out to the shoal on a barge, sunk into place, and the water pumped out. The granite and limestone blocks were brought out and set into place, an arduous task because time after time during the five summers required to complete the job, the coffer dam, twisted and broken by storms, would have to be rebuilt and made water-tight before being sunk again to the shoal, some 15 feet below the water line. 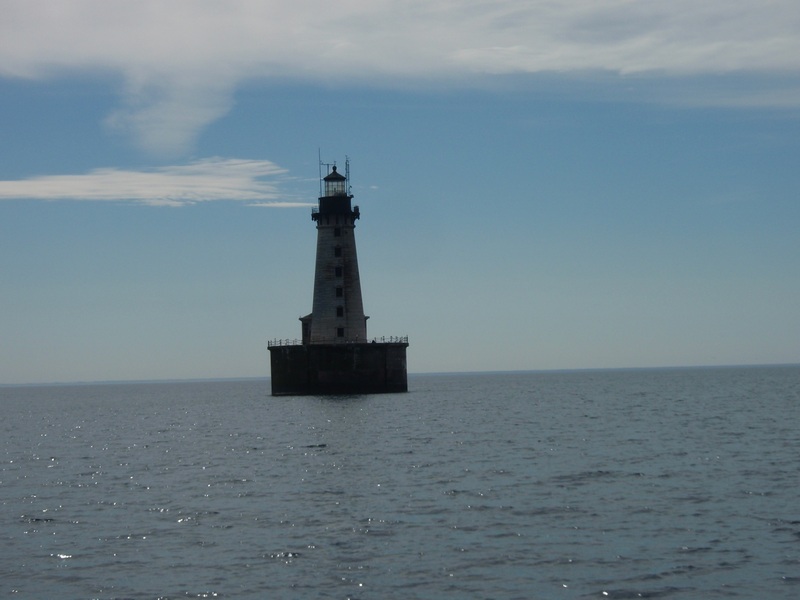 In 1883, the foundation was in place with a 15-foot promenade around its base, the tower was built, the machinery and second=order Fresnel lens manufactured in France were hoisted into place, and the first light flared out over the lake on July 4. An engine room housed two gasoline engines to furnish power for the foghorn and lifting crane. Since 1999, the Fresnel lens has been on display in the Marquette Maritime Museum. Under the tower in the middle of the crib was a cellar about ten feet below the water line which functioned as an iceless cooler for fresh meat and vegetables. 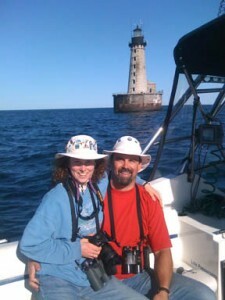 The crew had a 30-foot tender they used for rescues and occasional shore leave trips to Marquette for food and supplies. When the keepers arrived each Spring, they found the whole lighthouse sheathed in ice, resembling a huge iceberg with a 100-foot pinnacle. After chopping through into the engine room, they fired the boiler and used the steam hose to melt the ice off the crib and tower. Even the plate glass windows through which the light shone had a coating of frozen spray a foot thick..
I’ve made a number of summer fishing trips to the rock, but am now feeling the urge to pay it a winter visit by snowmobile from Big Bay, drill down, go ice fishing, take pictures to document the adventure, and write a Stannard Rock ice fishing rockumentary. 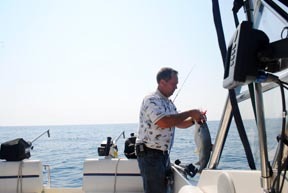 If you’re not into way offshore ice fishing, but would like to book a summer fishing trip to Stannard Rock, call Captain Brian Helminen (370.2257) or visit sandpointcharters.com. 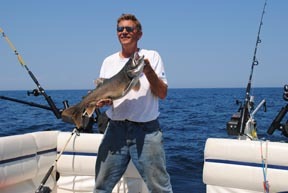 Brian is the owner and Captain of Sand Point Charters, LLC. He also owns and operates Designotype Printers, Inc. with his wife, Margaret. They have a cottage on Lac La Belle that can be rented by the week in the summertime. ← Winter – When Stannard Rock is just Memories and Dreams! Stay at Keystone Cottage, walk out the back door to the boat dock. Click for more details. Follow along on our journey on the Yooper Looper! Click to see more. © 2019 Sand Point Charters. All Rights Reserved.